Former Longhorns football, track star left his mark on those who followed, loved him. Jones , who grew up in Lampasas, died of cancer at age 60. 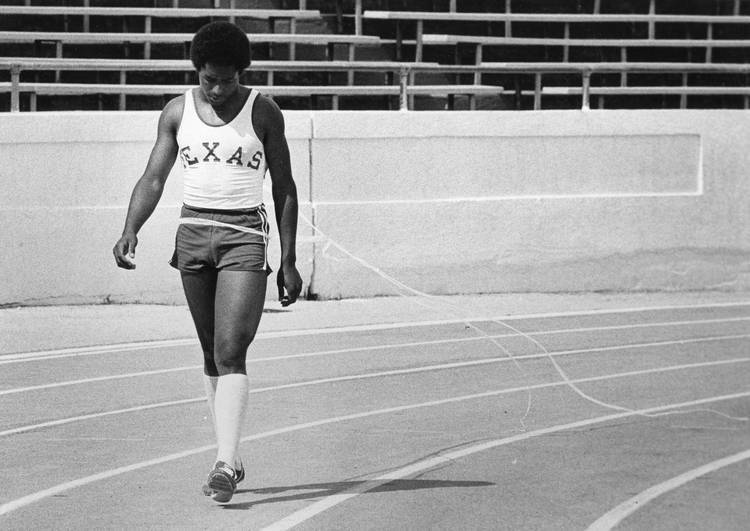 Jones won three gold medals at the 1976 UIL state track meet then a gold medal in the Summer Olympics months later. He battled substance abuse during his life before achieving sobriety and embracing Christianity over the last two decades. Texas exes Donnie Little, Alfred Jackson, Lawrence Sampleton, Randy McEachern, Ray Clayborn and Dwight Jefferson all sported No. 26 armbands. Former UT teammate Herkie Walls, now an Orlando, Fla. minister, served as the officiant. The legend of Lam Jones will always live forever in the hearts of Texas football fans and Americans who enjoy good old-fashioned speed on a track or football field. But sports were only part of his story. John Wesley Jones II — the man behind the nickname — was laid to rest in East Austin on Friday, right next to Texas coaching legend Darrell K Royal and near recently departed former UT President Bill Powers. Cancer claimed Jones at age 60, bringing to an end a story of utter athletic brilliance doused with a cautionary tale of life after fame. In this 2007 file photo, Johnny “Lam” Jones sits beneath a framed photo of one of his finest sports moments: Winning the open 100-meters race at the 1977 Texas Relays. (Jay Janner/American-Statesman). For the better part of a decade, John Wesley Jones played the background while “Johnny Lam” took center stage. Few teenagers can say they won three gold medals at the state track meet and then an Olympic gold medal in the same summer. That’s how the Lam Jones legend was born. The Longhorns faithful filled Ebenezer Baptist Church on East 10th St. on Friday morning along with childhood friends from his hometown of Lampasas. Texas exes like Donnie Little, Alfred Jackson, Lawrence Sampleton, Randy McEachern, Ray Clayborn and Dwight Jefferson all sported No. 26 armbands. Former UT teammate Herkie Walls, now an Orlando, Fla. minister, served as the officiant and kept the audience loose with his memories of being a senior at Garland who met Jones at the Texas Relays the summer before enrolling in college. Walls had won the high school division of the 100 meters the day before in a blistering time of 10.42. Childhood friends David Gonzales and Gary Milligan — who played football at Texas A&M — had a front row seat to the birth of a legend. They were seventh graders when Jones, a year younger, arrived from Lawton, Okla. in the early 1970s. Gonzales said Jones could play any sport with ease. Lam had few peers in the speed department from his prep days — his comeback in the Class 3A mile relay was arguably the biggest non-football moment in Royal-Memorial Stadium history — through the end of his NFL career. But life outside the sporting arena presented a much tougher challenge. He was still Lam to his fans, but behind the name was a man struggling to cope. Substance abuse played a large role in his professional career lasting only six years. The $2.1 million contract he signed with the New York Jets went away and his demons successfully waged war against him before he achieved sobriety and Christianity over the last two decades through the counsel of mentor Sam Mings, Sr. and, later, Bishop Reginald Thomas, who provided the eulogy Friday. Jones embraced charitable causes like the Special Olympics and his own Locker Room, where he ministered to young athletes and families whose children were afflicted by cancer. Years after his NFL career ended, he was simply John Wesley Jones II, a man living with a family in Fort Worth. He became fast friends with one of the family’s sons, a high school junior by the name of John Hygh, Jr. Hygh idolized Jones for the simple reason he wanted to play in the NFL as Jones did. They engaged in some some spirited one-on-one basketball games at the house of a neighborhood friend in the heat of the Metroplex summer. Jones, 13 years older, won the first matchup 15-13 before the youngster took the next two over the next few weeks. “The second time we played, I decided I would run him as much as I could. He looked at me and said, ‘You figured it out,'” said Hygh, who later played quarterback at Southwest Texas State before becoming a sports anchor at FOX7 in Austin. Hygh had several good male role-models in his life, but his time with Jones provided several life lessons. His story was a lesson for all.